By Molly Jane Kremer. 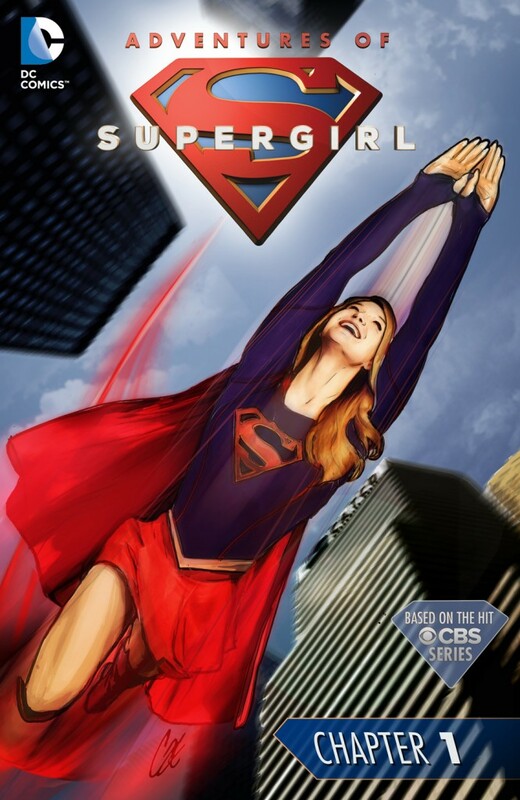 Following the considerable success of CBS’ Supergirl, DC Comics has finally brought Kara Zor-El back to comics with their digital-first series, The Adventures of Supergirl. And while that would be enough for fans of the Girl of Steel, the publisher wisely tapped longtime Supergirl writer Sterling Gates to helm the series, thus bringing the hit TV series and the sagas that inspired it full circle. Sterling Gates took a moment out of his incredibly busy schedule to speak with DoomRocket’s Molly Jane Kremer about The Adventures of Supergirl, to reminisce over his greatly admired Supergirl run with Jamal Igle, and to speculate upon the publishing future that lies ahead for Kara Zor-El. MJ: How much of Adventures of Supergirl is influenced by the CBS series? Have the actors’ portrayals (specifically Melissa Benoist’s spot-on performance as Kara, or Calista Flockhart’s acerbic Cat Grant) changed how you write for their characters? SG: In terms of the set-up, we follow the show’s take pretty closely: Supergirl works for the Department of Extranormal Operations, helping to track down and capture alien fugitives who were set free on Earth over a decade ago. In the meantime, she lives her day-to-day life as Kara Danvers, personal assistant to media mogul, Cat Grant. Adventures of Supergirl has been a really fun series so far. My editors have found some incredible artists to work on the series with me — including Bengal, Jonboy Meyers, Emanuela Lupacchino, and Cat Staggs — and we’re telling a big thirteen chapter story across the next six months. Our series takes place early in season one, in part because I didn’t want to step on any of the plot points that I know the show is doing, and in part so that I could write freely without having to worry about looping the show producers in on every decision we make. MJ: You and Jamal Igle had a three year run on Supergirl that’s widely considered to be the best the character’s ever had, making Kara one of the most realistic and relatable women in superhero comics. (You were ahead of your time, to say the least.) When working on either your original run on Supergirl or the new Adventures of Supergirl book, were there any previous runs or stories — or even characters from other media — that served as inspiration? SG: That’s incredibly nice of you to say. Jamal and I are still fiercely proud of the work we did on Supergirl, and I’m glad that our run is still remembered fondly by fans. We always set out to make Kara a character that people could relate to and root for even though she had powers far beyond those of us mere mortals. We tried to give her a classic superhero set-up, not unlike Buffy the Vampire Slayer or Peter Parker, so the book would feel familiar-yet-different. In fact, that was always something we talked about: give fans a familiar set-up, but put enough of an emotional or physical spin that it feels different enough you want to keep reading. We also knew going in that the “New Krypton Saga” was going to happen across all of the super-books and a lot of eyes would be watching us, so we tried to always do fun, big, personal stories that really showed us who Supergirl was and why she deserved to stand out amongst the superhero crowd. It helped that I was a very young writer working alongside some of the best comic writers in the business: Geoff Johns, Greg Rucka, and James Robinson. I’ve called it “comic book grad school”. They were brutally honest when reading my work, and gave some of the harshest critiques of my life. But it kept me honest, and it helped me to always bring my A-game on the books, and I think “New Krypton” and Supergirl were made all the better for it. I also had some really great editors in Matt Idelson and Wil Moss. 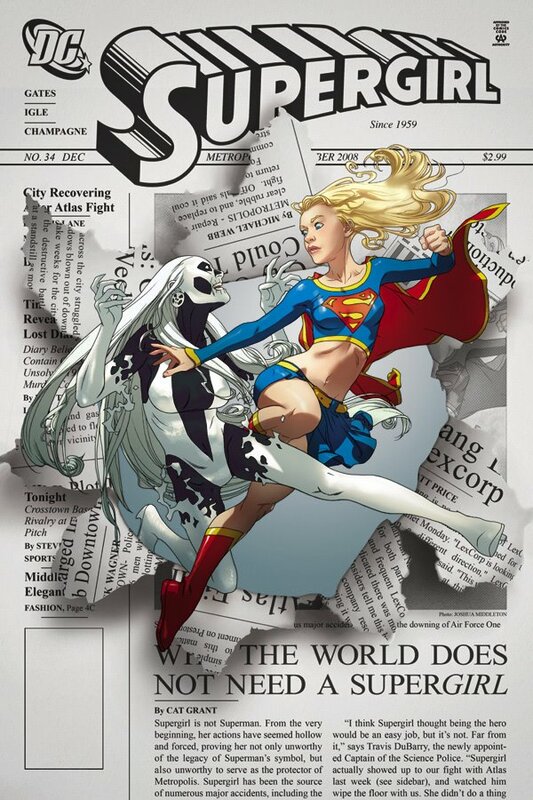 As for specific Supergirl inspiration, I took a lot from tv shows and movies and comics and books that I love, including Buffy the Vampire Slayer, Gilmore Girls, Russell T. Davies-era Doctor Who, the work of Joan Didion, Helen Slater’s take on Supergirl, and Paul Kupperberg and Carmine Infantino’s Daring New Adventures of Supergirl. SG: [laughs] Aw, c’mon. Winn has his good qualities… and his bad qualities. Just like any of us, sometimes the bad outweighs the good. Of the new characters to write, I really enjoy Alex. She and Kara have such an interesting, complex relationship, and it really reminds me of the “big sister” role we gave Lana Lang in the comics. Adventures of Supergirl will really dig into Kara and Alex’s relationship in a big way, as the two of them go on some pretty intense adventures in the book. MJ: What’s it like returning to Kara after so long, and after seeing her become so successful on television, due in no small part to your previous work? Jamal and I worked very hard to stabilize a book that had jumped all over the place in terms of tone and content for years. We did our best to present an optimistic teenage girl who was looking to find her place in two very different worlds, a situation fairly unique to the Supergirl mythos before we came along. I was really excited to see over the weekend that library resource website “No Flying, No Tights” declared our Supergirl run a “must have” and “your best bet for teen readers,” because we tried really hard to make a book that everyone could read. So often comic books with women leads are co-opted by certain demographics in the marketplace, and we wanted to make a book that anyone could pick up and enjoy. I’m also extremely proud that our Supergirl run almost exclusively features women. Kara, Alura, Lana Lang, Lois Lane, Cat Grant, Lucy Lane, Thara Ak-Var, Bizarrogirl, Superwoman… Jamal and I very quietly did a mainstream superhero title about women and their complex relationships to one another. We didn’t really tell people at the time that that was what we were doing, we just let the work speak for itself. Greg Berlanti, Ali Adler, and Andrew Kreisberg seem to have woven some elements from our run into the DNA of the show — Supergirl’s extremely complex relationship with Alura, Cat Grant’s anti-Supergirl publishing agenda, and Lucy Lane invading Supergirl’s life, for a couple examples — but they’ve clearly taken elements from all of Supergirl’s history to get the show on the air. 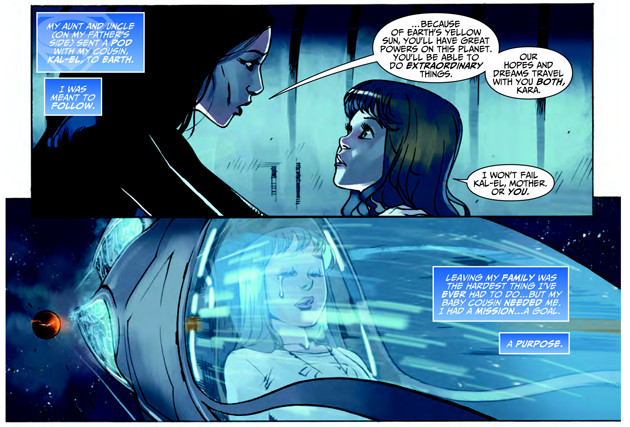 They’ve also generated a bunch of cool new elements that add to the Supergirl mythos. Astra, Alex, Winn, the DEO, Director Hank Henshaw, even their take on Max Lord, are all unique to their version of Supergirl. And Supergirl is all the richer for it! I mean, they read our books at some point — they gave a shout-out to me and Jamal in the pilot, which I freaked out about — but they’re making their own show. And I’m excited to tune in every week and see what happens next. MJ: Having seen your exuberant live-tweets of the show, I can hazard a guess, but is it fun to see particular plot points that you created in live action, and to see actors portraying your specific versions of characters? SG: Melissa Benoist’s performance as Supergirl is phenomenal. She’s the perfect mix of light-hearted charm and hard-fisted determination. 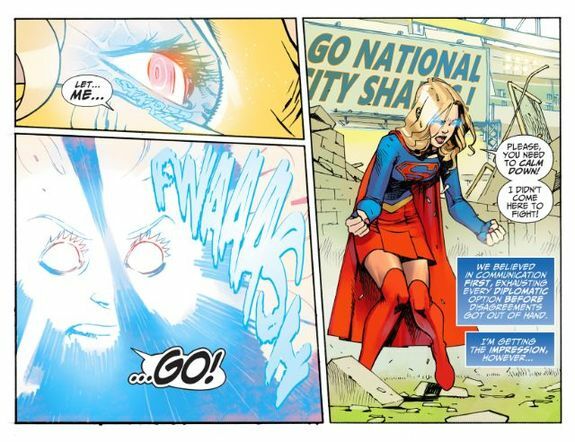 It was very surreal and utterly amazing to see Supergirl fighting Bizarrogirl on screen. I never thought I’d see that happen, honestly. I also never thought we’d see a Reactron fight on TV, either. Or a military-based Lucy Lane dating James “don’t call me Jimmy” Olsen. MJ: Is there anything you can tell us about Kara and her future within DC’s comics universe, and whether she’ll be making her long-awaited return to an ongoing print series? Last weekend saw the ComicsPRO announcement that there is more Supergirl material coming down the line, so there is hope for Kara Zor-El! Obviously, I’d love to continue to be involved with the character — she’s one of my favorites — but hopefully they have some great plans in place. I am very happy that DC’s Collected Editions department is gonna reprint some of the more classic Supergirl runs. The Peter David/Gary Frank run is getting a collection soon. Paul Kupperberg/Carmine Infantino’s Daring New Adventures of Supergirl will be out in trade paperback this summer, as will Landry Q. Walker and Christopher Jones’ Cosmic Adventures in the 8th Grade. So there are a bunch of great Supergirl collections on the way. Hopefully they’ll put me and Jamal’s run back in print at some point, or do new editions or something, but I think retailer/consumer demand for those books will be the only way it’ll happen. Until then, all our books are currently available digitally through the DC Comics app, Kindle, or comiXology. As I said, we’re fiercely proud of those books, and hopefully a digital second life will allow a new generation of readers to discover them. ‘The Adventures of Supergirl’ is available on comiXology now!